The negative symptoms have been described in association with schizophrenia since the early days of it being recognized as an entity. However, their elusive nature kept them unacknowledged until there was a revival of interest in them following the development of specific quantifying measures. Over the past three decades, there has been a tremendous surge in research on their types, measurements, status in the present classificatory system, and their implications. The developments in modern investigatory methods have provided the researchers with fresh insights into the underlying mechanisms, and a distributed functioning of the neuronal networks has emerged as the major abnormality. Accordingly, a variety of pharmacological and other treatment modalities have been developed which go beyond the traditional. Nevertheless, a lot remain unanswered. 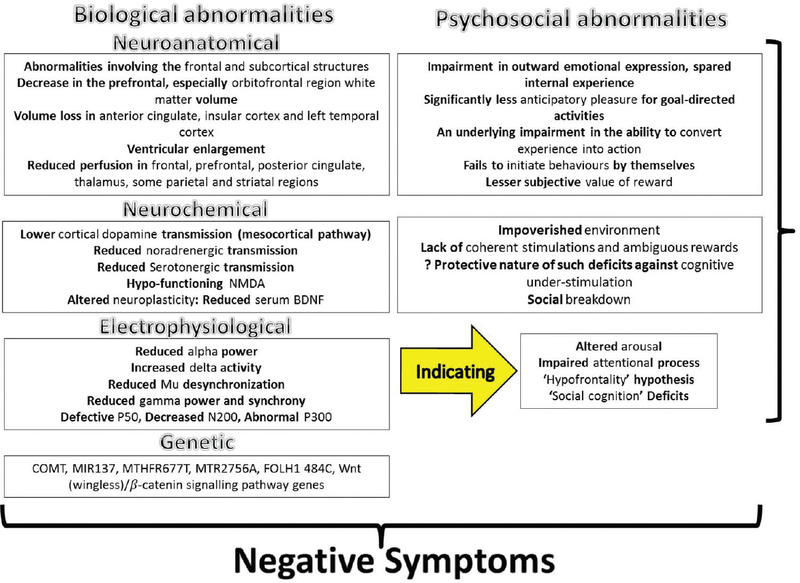 The present paper summarizes important concepts with regard to negative symptoms in schizophrenia. Due to explosive growth in technology and internet usage in the last few years, internet gaming disorder (IGD) has manifested as rapidly growing public health problem mainly affecting the teen and preteen population worldwide. It has a negative impact upon physical, psychological, social, and occupational functioning of the affected individual, often leading to severe consequences. It was only recently that it has been recognized as a separate diagnosable disorder in the Diagnostic and Statistical Manual of Mental Disorders Fifth Edition. Not much data is available regarding the exact prevalence and the various sociodemographic, clinical, and other risk factors to identify the individuals vulnerable to develop this disorder, especially in the developing countries such as India. According to a recent report, India ranks 22nd in the list of highest revenue-generating countries from gaming-related businesses, thus highlighting the magnitude of risk faced by Indian population. The aim of this review is to provide an insight about the disorder to identify the risk factors and clinical features, to understand the effect of IGD upon the psychological and physical health with a special focus on neural changes, and to provide information on the various upcoming preventive and treatment strategies. Introduction: A growing empirical literature has examined insomnia symptoms as a possible risk factor for a range of suicidal behavior. Not much literature is available in normal adolescent population. Aims: The aim is to find insomnia prevalence, studying various dream factors, and suicidality prevalence among students of various courses. To check if there is a relation between insomnia and suicidal behavior and dreams, particularly nightmares and suicide. Materials and Methods: A total of 400 students of various courses were assessed using Insomnia Severity Index and The Mannheim Dream Questionnaire and Suicide Behaviour Questionnaire. Results: Insomnia was present in 11%, 23%, 19%, and 19% and suicide behavior in 16%, 17%, 12%, and 22%, respectively, in medical, commerce, engineering, and arts students. Statistically significant correlation was found between suicide and insomnia severity and various dream factors. Conclusions: Insomnia and dreams had relation with suicidality in normal adolescent population. 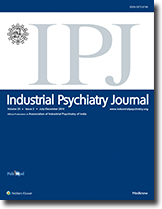 Background and Aim: Possible associations between depressive symptoms and work-related parameters have frequently been discussed in the literature. The present study was aimed to evaluate the work-related depressive symptoms and their possible-related parameters among male employees of Esfahan Steel Company (ESCO) as one of the most important industrial sites in Iran. Materials and Methods: With a cross-sectional design and a stratified random sampling method in 2010, a total of 400 male employees were enrolled from the operational parts of the ESCO. Results: Among 400 participated employees, 245 (61.3%) were rotational duty employees and 358 (89.5%) were reported making <$500. After applying the linear regression model, some variables including: economic difficulties (P = 0.022, odds ratio [OR] = 0.558, 95% confidence interval [CI] =0.339–0.919), family-related problems (P = 0.003, OR = 0.303, 95% CI = 0.138–0.669), and work environment (P < 0.001, OR = 0.244, 95% CI = 0.140–0.426) were found to be significantly associated with higher depressive symptoms among the participants. Conclusion: The present study brought to light the predictors of occupational depressive symptoms among blue-collar employees of ESCO. More research is needed to find the causal relations between mental health and work-related parameters among Iranian employees. Background: Obsessive Compulsive Disorder (OCD) is a chronic, distressing, anxiety disorder associated with significant functional impairment. Patient with OCD often suffer from one or more co-morbid disorders. Major depression has been the most common co-morbid syndrome. Comorbid Axis I disorders along with increased severity of comorbid depressive and anxiety symptoms, increased severity of obsessions, feelings of hopelessness and past history of suicide attempts have been associated with worsening levels of suicidality in OCD (Angelakis I, Gooding P., 2015). As per data Thirty-six percent of the patients of OCD report lifetime suicidal thoughts and 11% have a history of attempted suicide(Torres AR, Ramos-Cerqueira AT, et al, 2011). There is a reasonable probability that the patient of OCD have suicidal thoughts, plans or actually attempt suicide. Aim: To assess depression and suicidality in OCD patients. Method: This study was conducted on 50 patients diagnosed with OCD as per ICD 10 criteria, both outpatient & indoor, from department of psychiatry, Dayanand Medical College & Hospital, Ludhiana, Punjab, India. A socio-demographic proforma (containing demographic details), Hamilton Depression Rating & Scale, Columbia suicide severity rating scale (CSSRS) & Yale Brown Obsessive Compulsive Scale Symptom Checklist (YBOCS) were administered. Results: Mild depression was found out to be 40% whereas 16% were suffering from moderate depression and 10% and 14% had severe and very severe depression respectively. Suicidal ideation was found in 52 % of patients.16% of patients had history of actual attempt. Data showed that 70% of females had suicidal ideations. It was also found that in cases of severe and very severe depression associated with OCD all the patients had suicidal ideations as compared to 35% in mild and 87.5% in moderate depressive patients. It was found that 40% of severe depressive and 28.57% of very severe depressive patients had attempted suicide one or more times during the course of illness. Also suicidality was found to be maximum in those with symptoms of cleanliness and contamination (57%) followed by religious obsessions (45%), sexual obsessions (33%), repeated rituals (31%) and other obsessions like need to touch, ask (26%) respectively. Conclusion: OCD is associated with high risk not only depression but also of suicidal behavior. It is vital that patients of OCD undergo detailed assessment for suicide risk and associated depression. Aggressive treatment of depression may be warranted to modify the risk of suicide. Behavioral and cognitive techniques along with pharmacotherapy should be used to target co-existing depressive symptoms so as to decrease morbidity and mortality. 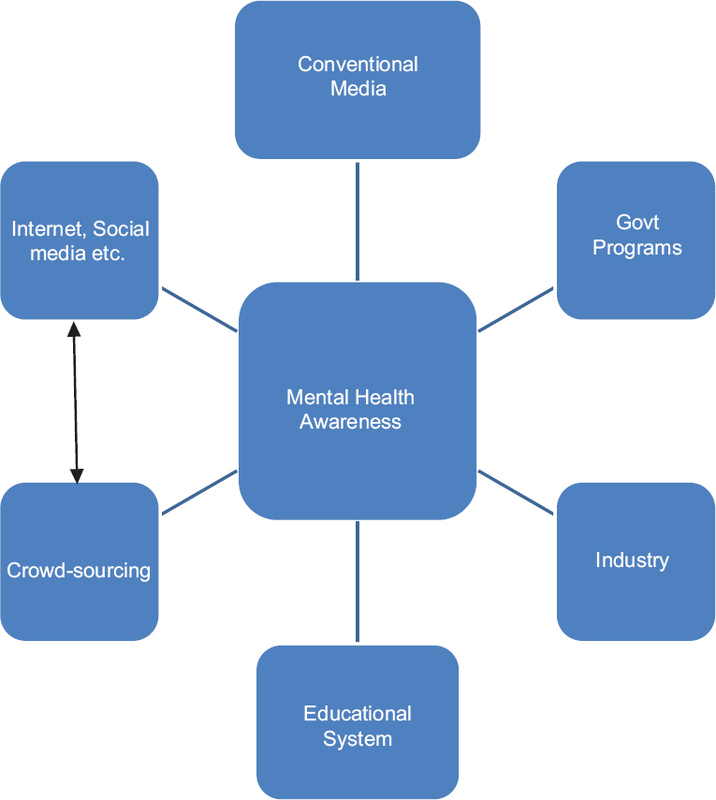 Introduction: The employment status of mentally ill patients is a reflection of their productivity, control of illness besides providing therapeutic benefits and integration into mainstream society. Owing to the associated stigma, self-reporting of mental illness (SRMI) often is rare. Census exercise of India in 2011 provides an insight of SRMI and employment status of such people. This study was undertaken to consider the role of gender, age group, and place on the employment status of SRMI. Methodology: Frequency of SRMI, age group, gender, and employment status was gathered from Indian 2011 census sources. Descriptive statistics and logistic regression were employed. P≤ 0.05 was taken as significant. Results: Majority (68.6%) of the SRMI people resides in rural areas, in the economically productive age group of 15–59 years (75.88%) and often males (57.51%). Of the SRMI as reported in the data, 78.62% were not employed while 2.4% of them were currently employed. The employability frequency distributions of SMRIs were statistically different in terms of area, age group, and gender with significance. Discussion: Although the mental illness data of 2011 census was rejected by mental health professionals citing discrepancy and underestimating of the prevalence of mental illness, it provides a robust estimate of the employability, self-reporting tendency of mental illness. The association of the factors provides a unique insight into SRMIs in India. Conclusion: Understanding the interplay of factors may yield robust estimates and clues for policy framers to formulate employment-related policies for employment opportunities for mentally ill patients. Background: Medical students undergo significant stress during training which may lead to own suffering or problem in patient care. High level of burnouts and depression is also not uncommon. The transition from preclinical to clinical training has been regarded as crucial to student in relation to the stress. Methodology: An assessment of perceived stress and its relation to general psychopathology, the pattern of coping, and burnout in the final-year medical student was done to bring out clear nature, pattern, and extent of the problem. Results: Perceived stress had statistically significant association with general psychopathology and depressive-anxiety component of burnout. Acceptance, positive reframing, humor, planning, and active coping correlated with lower score on perceived stress. Conclusion: Higher score on perceived stress was associated with higher scores on general psychopathology and burnout. Age of joining MBBS course and doctor in the family did not affect the stress significantly. People who displayed positive coping strategies had lesser stress and general psychopathology. Background: Adolescence is a period of physical, nutritional, and sexual transition, also remarkable for the accompanying psychological changes. Worldwide, 20% of children and adolescents suffer from a disabling mental illness. Therefore, knowledge of the prevalence of these disorders can be used to design intervention strategies. The present study was conducted in the 13–15 years' age group schoolgoing adolescents, with the objective to estimate the prevalence of psychological morbidity, employing Strength and Difficulties Questionnaire (SDQ). Materials and Methods: A cross-sectional analytical study was conducted in three different schools of Aligarh, in the 13–15 years' age group, with a prior permission from the school authorities. The study was approved by a multidisciplinary Institutional Ethics and Research Advisory Committee. Results: A total of 1456 students were sampled for the study. The prevalence of psychological morbidity on the basis of total difficulties score was found to be 9.75% (95% confidence interval - 8.33–11.39). The prevalence of emotional, conduct, hyperactivity, peer, and prosocial problems was 5.42%, 5.56%, 3.78%, 4.40%, and 4.26%, respectively. Conclusions: Psychological problems are fairly common in the adolescent age group. Despite the need, there is a dearth studies conducted in this crucial age group in India. Of the studies available, a wide variance is reported either due to the difference in diagnostic tools or due to the types of psychological disorders considered in different researches. For the purpose of uniformity and comparability, SDQ stands as a good option. Background: Past research studies on the exploration of attributes to the stress of doctors/medical interns were reported more often than the types of coping strategies, healthy practices to strengthen their internal resources to deal effectively with the stressful situations. Objectives: The present study was conducted to find such internal resource – “mindfulness” as a mediator of coping, perceived stress, and job satisfaction among medical interns. Methods: A cross-sectional descriptive study comprised 120 medical interns forms from various medical colleges in Mangalore were recruited and completed the assessment on mindfulness, cognitive-emotive regulation, coping strategies, perceived stress, and job satisfaction from doctoral interns were collected. Results: Initial correlation analysis results indicate that adaptive coping strategies significantly associate with greater mindfulness and less perceived stress. In turn, mindfulness is negatively correlated with nonadaptive coping strategies and perceived. Job satisfaction showed no significant relationship with any of the other variables. Mediational models indicate that the relationship between adaptive coping strategies and perceived stress was significantly mediated by mindfulness. Furthermore, partial mediation between nonadaptive strategies and perceived stress through mindfulness indicates that respondents reported a high level of nonadaptive strategy experience and a lower level of mindfulness can be counterproductive as they encourage the ineffective way to deal with the stresses. Conclusion: The implication of the results were discussed with suggesting a possible intervention to improve the adaptive strategies and mindfulness among the medical interns. Background: Persons with long-term psychiatric disorders have greater deficits in living skills as well as greater problems in employment and relationship to their social environment. Thus, chronic psychiatric illnesses have psychosocial consequences such as disability and impaired quality of life (QOL) due to their symptomatology and chronic course. Objectives: Assessment and comparison of disability and QOL of patients suffering from schizophrenia and obsessive-compulsive disorder (OCD) in remission phase. Materials and Methods: A cross-sectional study carried out in the psychiatry outpatient Department of Mental Health Institute, S.C.B. Medical College and Neuropsychiatric Consultation Centre, Cuttack. The study sample consisted of fifty cases of each groups (schizophrenia and OCD), which included both males and females. All of them were assessed through the World Health Organization-QOL BREF and Indian Disability Evaluation and Assessment Scale. Results: Results revealed that schizophrenics have poor QOL and greater disability burden than patients of OCD. Conclusion: These psychiatric illnesses, i.e. schizophrenia and OCD, affect all areas of daily functioning leading to greater disability, and thus increasing the burden on the family, imposing greater challenges for the rehabilitation of these patients and their inclusion in the mainstream of the family and society. Background: Hajj pilgrimage, in Saudi Arabia, is one of the world's largest religious mass gatherings. We have similar mass gathering scenarios in India such as the Amarnath Yatra and Kumbh. A unique combination of physical, physiological, and psychological factors makes this pilgrimage a very stressful milieu. We studied the emergence of psychopathology and its determinants, in this adverse environment in mass gathering situation, in Indian pilgrims on Hajj 2016. Materials and Methods: This is a descriptive study analyzing the mental morbidity in 1.36 lakh Indian pilgrims during Hajj 2016, using SPSS software version 19. Results: Totally 182 patients reported psychological problems. Twenty-two patients (12%) required admission. Twelve (6.8%) pilgrims reported a past history of a mental illness. One hundred and sixty-five (93.2%) patients never had any mental symptoms earlier in life. The most common illnesses seen were stress related (45.7%) followed by psychosis (9.8%), insomnia (7.3%), and mood disorders (5.6%). The most common symptoms recorded were apprehension (45%), sleep (55%), anxiety (41%), and fear of being lost (27%). Psychotropics were prescribed for 46% of pilgrims. All patients completed their Hajj successfully and returned to India. Conclusions: Cumulative stress causes full spectrum of mental decompensation, and prompt healing is aided by simple nonpharmacological measures including social support and counseling in compatible sociolinguistic milieu. Zolpidem, an imidazoline nonbenzodiazepine sedative drug, is used widely. Initial reports showed minimal abuse potential. However, multiple reports have appeared of dose escalation and abuse. Subjective effects of high-dose zolpidem are not known. In light of accumulating evidence of abuse potential, we hereby report a case of high-dose dependence and a review of relevant literature. A 33-year-old male presented with 5 years of daily use of 600–1700 mg of zolpidem tartrate. He reported subjective effects of euphoria, intense craving, and inability to stop use. Loss of receptor specificity, pharmacokinetic factors, and different receptor distributions can explain paradoxical stimulatory effects of high-dose zolpidem. Further studies are required to characterize subjective effects of high-dose zolpidem. Adverse skin reactions are an important type of adverse drug reactions which have been reported with a wide variety of psychotropics including both typical and atypical antipsychotics. Like typical antipsychotics, atypical antipsychotics such as olanzapine, risperidone, and paliperidone have been documented to cause skin reactions. Reports of aripiprazole-induced skin reactions are sparse. 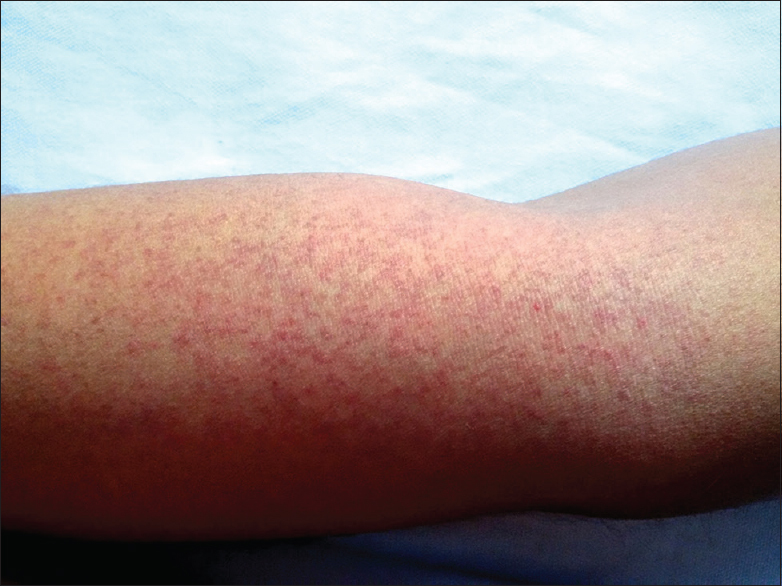 We report a case of skin rash that developed after starting aripiprazole in a male patient suffering from schizophrenia and which remitted after the drug was stopped. Male genital self-mutilation (GSM) is a rare but serious phenomenon. Some of the risk factors for this act are the presence of religious delusions, command hallucinations, low self-esteem, and feelings of guilt associated with sexual offences. Other risk factors include failures in the male role, problems in the early developmental period, such as experiencing difficulties in male identification and persistence of incestuous desires, depression, and having a history of GSM. The eponym Klingsor Syndrome, which involves the presence of religious delusions, is proposed for GSM. Psychiatric case reports of male GSM in the literature are rare and mostly anecdotal. Meige's syndrome consists of idiopathic blepharospasm and oromandibular dystonia. The exact etiology is not known and various hypotheses have been proposed for its causation. The hypothesis suggesting dopaminergic and cholinergic hyperactivity is most widely accepted. There is no curative drug for Meige's syndrome although a variety of treatments have been proposed. We report a case which responded to tetrabenazine.